Named as the no.1 seeded player for the Junior Boys' Singles tournament at the 2018 Côte d’Ivoire Junior and Cadet Open, Youssef Abdel-Aziz demonstrated on Monday 2nd April that he was indeed above the rest in the category after the Egyptian star successfully came away with the gold medal in Abidjan. Beginning the day at the quarter-finals stage of the competition, Youssef Abdel-Aziz achieved back-to-back victories against players representing the host nation with Cedric Zaouli Bi (11-5, 11-5, 11-3, 11-5) and Andre Bly (11-3, 11-5, 11-3, 11-3) falling to the Egyptian on his path to the gold medal match. The final saw top seed Youssef Abdel-Aziz face opposition from the second seeded player Ahmed Elborhamy, who proved to be a most worthy adversary in an all-Egyptian encounter. With little separating the two finalists by the close of the opening four games the title race was beautifully poised, but despite a brave effort from Ahmed Elborhamy it was Youssef Abdel-Aziz who emerged from the tie victorious across six games to lift the trophy (9-11, 11-7, 11-8, 8-11, 11-5, 11-7). Rivals in the evening session of play but earlier in the day Youssef Abdel-Aziz and Ahmed Elborhamy partnered up to great success in the Junior Boys’s Doubles event. Coming through their opening two fixtures without dropping a game the top seeded pairing of Youssef Abdel-Aziz and Ahmed Elborhamy continued their impressive run in the final, breaking the hearts of the home fans with a straight games victory over Côte d’Ivoire’s Cherif Gbane and Ibrahim Gueye (11-1, 11-7, 11-9). China enjoyed a positive day out in the Junior Girls’ Singles and Junior Girls’ Doubles tournaments with both trophies going to the country’s representatives. Defeating top seed Selena Selvakumar in the last four (6-11, 11-8, 11-6, 11-8, 11-8), Chen Junjin, seeded third, went on to secure the Junior Girls’ Singles crown in Abidjan with a powerful performance against fellow compatriot Lin Lequan in the title contest (11-5, 11-6, 11-5, 11-9). 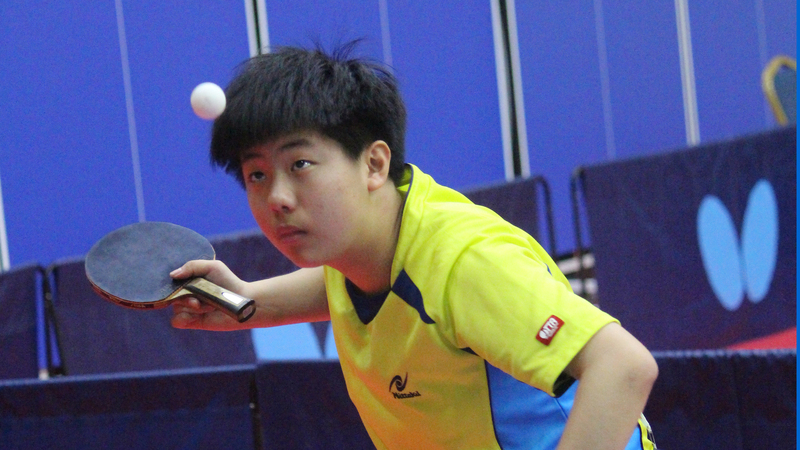 Chen Junjin and Lin Lequan were also involved in the Junior Girls’ Doubles final, beating Rebecca Houngue and Christine Kamenan (11-4, 11-2, 11-4) to secure their place at the top of the medals podium.